Aluminum 0.5 deg. toe-in rear hub carriers for Slash 4x4 (Blue) 1 Pair Discounts Apply ! SPTST1952-5B - Aluminum 0.5 deg. 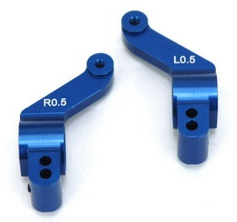 toe-in rear hub carriers for Slash 4x4 (Blue) 1 Pair. Our new precision CNC machined rear hub carriers add an extra 0.5 deg. toe-in over the stock plastic hub carriers for a little extra rear traction and stability. These hubs also features our new manufacturing process that drills the bearing holes after anodizing, which allow the tightest tolerance possible around the bearing area.